Your colour, your size and your song are what matters if you are a bird choosing a mate. In a polymorphic species, where several colour variations exist side-by-side, mates are chosen often because they match the chooser. 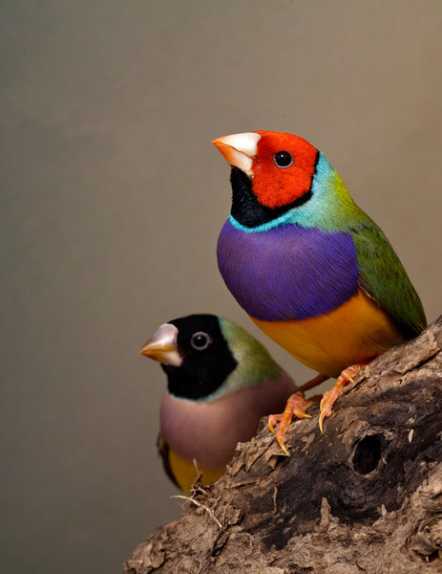 But in the very rare and absolutely beautiful Gouldian finches (Erythrura gouldiae) from northern Australia, this can only happen with the use of the right eye, linked internally to the brain's left hemisphere. Black males for example show a strong lateral preference for black headed females with their right eye, and didn't like red or yellow (too rare to be tested!) morphs much! The zebra finch also uses his right eye to eye up his female during a static early stage of courtship. This seems to mean that these birds have a strong specialisation in each hemisphere for different tasks. Mammals are fortunate in having a corpus callosum that transmits messages between the two hemispheres of the brain. In birds, the same process takes many hours to transmit. Lizards and fish have been fund to have the same limitation. In this series of experiments, 16 homozygous black-headed male birds' individual eyes were patched or not and then given a chance to choose from among another black male, a black female and a red female. All were sexually naive. The experiment was in fact very simple for Jennifer J. Templeton and her three colleagues in Knox College, Illinois, in the US and Macquarie University in Sydney. They publish today in the journal Biology Letters. Even the eye cover was simple cones of cotton attached to the feathers with Ardell eyelash glue. (At last a useful task for something I always thought was totally unnecessary). Courtship singing was noted as well as the time spent eyeing up the females. The results showed no significant difference in preferences when males could use only their left eye. Of twelve males who participated, eight sang to at least one) female on at least one of three trials. Males were more likely to sing to a red female when using their left eye. One individual actually sang once to a female while using his left eye but naturally, this was insignificant among the total figures. What was significant is that left eyed males could not discriminate between black females, black males or the very different red females. Here is a video of the set-up, which looks to me like some priceless exhibit out of the Tate Modern (museum of art!) See what you think. The male's left eye is patched during the 45 minute trial: this is about 12 minutes into the trial, with the black-eyed female in the chamber on the left. We must congratulate these workers on the very first demonstration of visual mate choice lateralisation. Now the other groups that could have similar lateralisation need to be investigated. Birds will be first and it's intriguing that so many birds do have lateral displays during their complex courtships. Showing your best side is only part of the story: the male will also enhance his display if he can view the "apple" of his eye with the right eye! The unromantic theory of course is that this procedure saves a lot of time and energy. There is now a great list of lateralised functions among birds and others. Both cognitive and behavioural functions are included, such as social recognition, avoidance of predators and feeding. In ducks, a delightful example is sleep. As Jennifer Templeton tells us, "They are able to keep one eye open - and one hemisphere awake - while the other hemisphere sleeps. Very useful!" A most valuable addition to our knowledge will be the understanding of how this valued endangered species behaves, so that it can be helped in the wild and in its captive breeding programmes. Contribute if you wish to the Save the Gouldian Fund, which is funding a nest box programme that is hoped to increase reproductive successes. There are 2500 or so in the wild (widely spread in tiny flocks), but fire patterns are causing great loss of numbers, while a thriving captive bird industry keeps tame specimens. It should be stressed here that the wild bird is very important in order to maintain captive stocks in good condition, genetically.